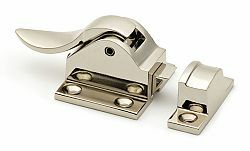 The ZIBCL-AB from Cliffside Industries is a solid zinc traditional cabinet latch. Finished in Polished Nickel, these ice box latches are made from premium solid zinc and crafted carefully by skilled artisans. Ice box latches are reproductions of the hardware used on antique ice box refrigerators. Some types of ice box latches opened perpendicularly, where the lever was vertical and the catch opened the door horizontally. On others, like this style, the lever is parallel to the tongue. Designed with a special proprietary spring that allows them to open and close with virtually no squeaking. Add a secure element to your cabinet by requiring specific action to operate instead of just pulling a knob or handle. Cabinet latches also are an interesting design element because of their shape. The ice box latch is elongated and narrow, rather than simply round.